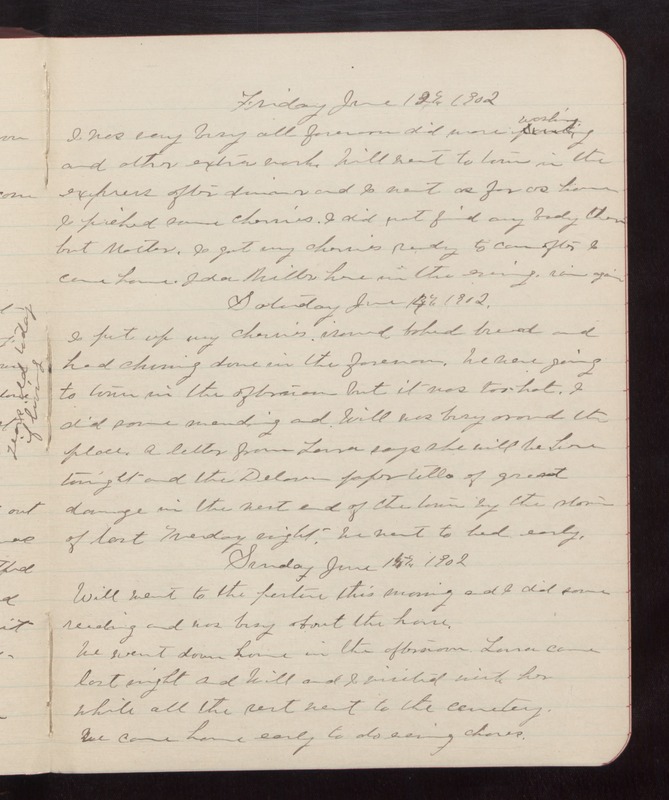 Friday June 13th 1902 I was very busy all forenoon did more washing and other extra work. Will went to town in the express after dinner and I went as far as home. I picked some cherries. I did not find any body there but Mother. I got my cherries ready to can after I came home. Ida Miller here in the evening. rain again. Saturday June 14th 1902 I put up my cherries, ironed, baked bread, and had churning done in the forenoon. We were going to town in the afternoon but it was too hot. I did some mending and Will was busy around the place. A letter from Laura says she will be here tonight and the Delavan paper tells of great damage in the west end of the town by the storm of last Tuesday night. We went to bed early. Sunday June 15th 1902 Will went to the pasture this morning and I did some reading and was busy about the house. We went down home in the afternoon. Laura came last night and Will and I visited with her while all the rest went to the cemetery. We came home early to do evening chores.